Everyone knows fresh vegetables are nutritious, and the U.S. Department of Agriculture's Dietary Guidelines for Americans recommends that you eat at least 2.5 cups daily. But fresh vegetables can be pricey at times, and they risk being contaminated with harmful bacteria. Choosing vegetables during their peak season and handling them with care will save you money and help you avoid any detrimental effects while enjoying their health benefits. 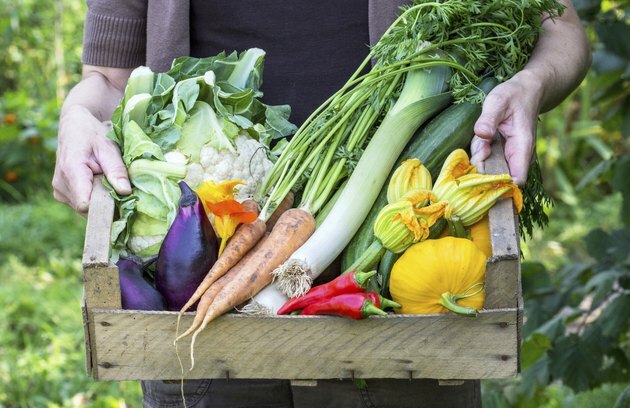 The 2010 Dietary Guidelines for Americans lists a few advantages of eating more vegetables. They are major contributors of nutrients most Americans are lacking, and they can help prevent serious health conditions and diseases. Vegetables contain folate, magnesium, potassium, vitamins A, C and K, not to mention dietary fiber, in varying amounts. The Dietary Guidelines state that consuming at least 2.5 cups of vegetables a day reduces your risk for heart disease and stroke and may protect you against certain types of cancer. Fresh, local vegetables picked at their peak and brought directly to your table will have more nutrients than some canned varieties, as well as vegetables that have been shipped from long distances to your grocery story. One cup of raw vegetables contains about 25 calories. If you are trying to lose weight, fresh vegetables can help you meet your goal; they give you the option of eating them raw as a snack if you suddenly have the munchies or cooking them in your favorite stir-fry for dinner. Choosing fresh vegetables also allows you to prepare them a variety of ways, including roasting, sauteing, steaming or just eating them raw. Fill half your plate with vegetables at meal time to keep your calories down and your stomach full. Depending on the time of year and the availability in your area, certain fresh vegetables can be more expensive. To save some money, watch grocery ads for sales; some grocery stores will price-match sales from competitors. Buy fresh vegetables in season and avoid prepackaged fresh vegetables. For instance, buy a head of lettuce and fresh salad ingredients instead of a bagged salad. Fresh vegetables spoil faster than canned or frozen varieties. Purchase just what you need to avoid throwing away vegetables that sit in your fridge too long. Storing your vegetables correctly also reduces waste. Vegetables you can keep in your fridge include green beans, broccoli, carrots, cabbage, lettuce and spinach. Vegetables that should be kept at room temperature include potatoes, cucumbers, peppers, tomatoes and winter squashes. Fresh vegetables can become contaminated with harmful bacteria. Conventional and some organic vegetable producers also use pesticides to keep damaging insects from ruining their crops. Washing your fresh vegetables, including organic varieties, under running water should remove bacteria and pesticide residue. Purchase vegetables that aren't bruised or showing signs of spoilage. Keep your vegetables away from raw meats at the grocery store and when preparing meals to avoid cross-contamination of bacteria that could make you sick. National Pesticide Information Center: How Can I Wash Pesticides From Fruits and Veggies?